Kaname invites Tatara to his dance studio. Although he would normally never set foot in such a place, Tatara is captivated by Sengoku's commanding presence. Granted an opportunity to dance with fellow classmate Shizuku Hanaoka—who often practices at the studio—Tatara realizes there's something about the idea of being put in the limelight and dancing where people will see him that keeps him coming back. With an earnest, passionate drive to improve, Tatara begins his journey into the world of competitive dance. "This adaptation is like a painting, it has a beautiful frame that could be the story itself presented and maintained throughout the show, and the remarkable artistic quality of the main characters enclosed in this frame that is compared to the hypnotic and vivid sunset that fascinates our eyes and earns our total attention." At first, you may be a bit skeptical after reading the summaries of this anime, the central theme is a bit unusual, a ballroom anime. Also, you can consider, a dance competition, another anime about some championships or tournaments that could be similar to any other sports anime, but you could be wrong. Ballroom e Youkoso is a fantastic adaptation that combines excellent storytelling with fabulous art design and captivates viewers by making them want more. Sadly, not all is perfect, the use of CGI could be weird and creates an ugly contrast between the characters' art and the scene background but it isn't a big issue. The anime has two main story arcs. The first one, the introduction of Tatara Fujita, the main character. An important fact is the display of Tatara's problems and insecurity. In addition, this arc presents the secondary characters, such as Kiyoharu, Shizuku, Mako, and Gaju. These characters enhance the narrative, the dynamics of the dance and the tournaments. They create an initial rivalry between Tatara, but the most exciting part is that they are still mates and support each other in their way. In other words, it is a healthy rivalry that is needed to help in the growth of Tatara and does not conceive the effect of a villain or a pompous competitor as we can see in the typical sports adaptations. Simultaneously, this arc reveals the differences that exist between the characters and establishes a challenging atmosphere among all of them. The second arc presents the other main character, Chinatsu Hiyama, and you can feel the progression of Tatara. Chinatsu is the opposite of Tatara. She has a dazzling personality, is rebellious and very strong. She also has a lot of experience in dance, so on many occasions, she shows her displeasure about the way of leading proposed by Tatara. She can not understand Tatara's personality. However, their relationship turned up due to Tatara's personality. For my eyes, Chinatsu is the perfect complement for Tatara. On the other hand, you can see a new secondary character, Kugimiya Masami. He is a shadowy character who could be Tatara's antagonist. For several viewers, including me, Kugimiya could fit the description of an odious competitor with some secrets. This figure is very dark and mysterious. He hates Tatara, and even the art portrays him with a faint aura. However, after a closer look, this character has been affected by several "life" problems that could be a reflection of Tatara if he abandoned his passion for dancing and improving. Kugimiya even compared himself to Tatara, and that bothered him more. All those elements created a beautiful story with a good rhythm, excellent narrative and with outstanding characters that can feel real. To conclude, the standard sports anime could not cope with Ballroom and Youkoso. The series has everything: A story of high quality, with a good pacing, realistic characters, sadness, joy, need, frustration, etc. The anime emphasizes concepts such as trust between couples, their understanding, and conviction. We can observe the constant need to overcome and the hard work required to achieve a change both personally and competitively. This anime has two scenarios. The first, the interaction of the characters outside the "ballroom." A rational world where the characters are beings with needs, problems, and feelings. The second world is inside the ballroom. A place with its own sets of rules where the score and the leader-companion relationship matter. This ambiance adds pressure and rivalry to the story, creates a dynamic where feelings of the characters bloom. Maybe my criteria could be biased since I have dance competition experience. However, seeing the relationship between partner and leader brought me many good and bad memories such as the foot pain after an event =D. To rephrase it, Tomo was able to convey those feelings to the audience, and that made me feel very happy because it stands out the realism. There are still some problems with the story, however. The most visible is the lack of a real ending. Tomo fell ill, so she could not advance in the manga story. The animation exceeds the progress of manga story, so the conclusion of the adaptation could be original compared to the continuation of the manga, and it felt a bit rushed. Therefore, there may be reasonable speculation about when, or if, the date of the second season. The adaptation has a good number of characters. Perhaps the most relevant is the personality of the couples in competition. For example, the pair of Tatara in the first arc is utterly different if compared to the second arc because the couple has a distinct personality and that reflects the way the couple dance and act. For example, Mako is more delicate and shy compared to Chinatsu, who is more rebellious and strong. I'm sure that Tatara will continue to grow in the manga, and it is likely that a relationship between Chinatsu and Tatara will arise, but we can not rule out a possible attraction between Tatara and Shizuku. Tatara Fujita. He is a shy and insecure person who cares for everyone and, in particular, for his partner. Tatara was looking for a place to fit in, and the dance was a door of change for him. However, he is in constant development, his features remain constant, but explode during competitions. Maybe this character is a bit complex, but that is what makes it real. Chinatsu Hiyama. Even if she was added halfway through the entire adaptation, her impact is gigantic. The personality of Chinatsu changed the dynamics of the narrative and directly affected Tatara's character. She is a rebel, strong, and has a lot of experience in dancing. She does not visualize Tatara as a good leader, sometimes she tries to follow him, but everything ends in constant frustration. However, she gives Tatara a chance to the point that both fight hard and evolve. It is a character with whom I feel connected, and I think there is a lot to see about its complexity. Kiyoharu Hyoudou: You can say that he is the best dancer in the series. He is very talented and may be Tatara's main rival in the future of the story. He does not have any opponent that overcomes him. However, he helps and guides Tatara as he considers him as a rival with enormous potential and with a lot of raw skill. Shizuku Hanaoka: She is the best companion. However, it could be said that she depends on Kiyoharu's leadership. She finds Tatara's unusual dance skills to the point that she decides to wait for his evolution and supports him. It is still too early to see if there are sentiments of her towards Tatara. The remaining characters are essential as well, but I don't want to prolong any further. Ballroom e Youkoso is quite impressive regarding sound and illustrations. The art follows the dynamics of dance and is quite clean. The movement and the characters, in general, is real. Usually, the scenes make the eyes focus on the pairs because of the color palette and the details. However, a high level of detail and quality isn't maintained in the surroundings (CGI use). Besides, if the eyes change from the principal observation point, you will notice some awful disparity between the surroundings and the couples in some scenes, do not let that change your decision towards the anime. Several good animations do not have the budget to fill the whole scene with a high artistic quality; sadly this one is the case. Lastly, some camera angles can give the impression of disproportion because the postures of the different dancing styles are complicated, but it must be taken into account that they are positions with a high degree of realism. The color palette is very vivid and uses a high contrast of colors where you can see the beauty of the couples, and this marks the details and character traits of the cast. About the sound, it's awesome. The series uses a vibrant score. In addition, it is listened to in a very soft way and keeps the rhythm and the action going. This helps the movement of the scenes especially the dances. The OPs and EDs are excellent and enjoyable. In my personal opinion, OP1 and ED2 are the best. I can not complain about this show; it is very entertaining. The narration is very fluid with an acceptable rhythm, creating the perfect environment for any spectator. The characters are complex and stand out. However, for some anime fans, it is possible that this type of genre is not pleasant or will complain by the lame use of the CGI, but it is not a reason to overlook this fantastic adaptation. I'll be waiting for a continuation of the manga, and I hope that in the next few years the animation of Ballroom and Youkoso will continue. Competition is a beautiful thing. It makes us strive to accomplish, to win, and hope that we can simply be good at something in our lives. When it comes to expressing talent, we try to be the show-off and express it like a form of art. For a guy named Tatara Fujita, he just wants to prove to the world that he can be good at something. That is, one day…he discovers the world of ballroom dancing. Watching Ballroom e Youkoso (Welcome to the Ballroom) feels like taking a journey down memory lane. I’m talking about the type of memory lane where you were once a kid and wanted to prove everyone you had talent in something. Academics, sports, art, acting, singing. Just anything in general that make your friend go “wow, I didn’t know you could do that!” As such, this anime is one that I found remarkably realistic and relatable. The first few episodes doesn’t take long to establish the principle cast along with its intention. I’ll be honest here. Tatara is a character that won’t be very easy to accept for most people at first glance. He has a meek personality and seems to overestimate himself on certain circumstances. This is shown in the beginning when Tatara expresses to professional dancer Sengoku that he wants to be a pro rather than just to dance. His initial attitude makes him look like a fool as dancing isn’t just something that can perfected like a click of a switch. My impression of Tatara made me realize that while he sets high expectations for himself, he does have potential but needs the right people and time to unlock it. Luckily, Tatara gets the opportunity at the Ogawara Dance Studio where other talented dancers gather to perfect their work. From the studio, Tatara also meets the very talented and beautiful Shizuku. She becomes a source of inspiration for Tatara as he strives to improve and become a pro. 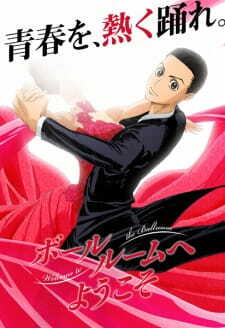 Throughout this show, Tatara embraces the art of ballroom dancing and becomes very determined to prove himself. From an amateur to an inspiring ballroom dancer, his character can really grow to people as we see his progress. The storytelling builds on many fronts although most of it still follows Tatara and his journey. He deals with personal issues, social problems, and also establishes rivalries with certain characters he meets. At the same time, an important part of this show involve him building important relationships with others. Two particular characters stands out the most: Mako Akagi and Chinatsu Hiyama. As dancing partners, Tatara’s relationship with both of these girls vary in attitude. Mako and Tatara has a friendly relationship that is based on trust, respect, and strong spirit. On the other hand, Tatara and Chinatsu’s relationship is more borderline towards competitiveness. Not to mention, Chinatsu already has a dancing background and doesn’t tolerate a weak partner. Throughout the anime, we see how Chinatsu begins to accept him more with their growing trust. In respect, Tatara also develops as a person as he crafts his own dancing style so that it’s not just his partner carrying their dances. Whether he realizes it or not, Tatara even has influence on others. This includes making Mako realize how skilled she really is, restoring Chinatsu’s love for dancing, and even influencing Shizuku to improve herself to be better. In retrospect, this anime steps over the line to make Tatara a more likeable character as time goes on. Unfortunately, I can’t really say all the main cast gets decent screen time and development. While Shizuku is Tatara’s initial inspiration, she doesn’t get much highlight later on in this show. Don’t expect this anime to focus much on Tatara’s love life either. While it’s obvious that Tatara crushes over Shizuku from the beginning, the show makes it clear that she prefers dancing rather than finding a boyfriend. This also applies to Tatara’s other dancing partners so if romance is something on your mind, then look elsewhere. Also, be aware that this anime focuses a lot on dancing. By a lot, I mean a LOT with all types of dances, music, and style. If you’re not a fan of dancing, it may take some time to enjoy this show. Ballroom dancing is portrayed as a fierce competition on the dance floor with some episodes dedicating their entire time to it. Luckily, this anime is quite a faithful adaptation for what it had to work with. With only some minor differences, it’s an anime that really made me glad it got adapted. However, there are times that I wish the anime picked up the pace with its extensive background storytelling, especially in later episodes. Adapted by Production I.G., this was really the number one choice. They are known for making other anime that involve competition come to life. (ex. Haikyu, All Out!, Kuroko no Basket) For this particular anime, they leave a memorable impression with the art style and character designs. The biggest selling point is the smooth camera angles and timings. When the competition gets fierce, it really draws out the talents of the dancers with their body movements. Each movement is precisely timed to show their potential with colorful aesthetics. It further amplifies them through clever facial expressions. The dancing outfits in this anime are also memorable for their coloring and hair style, in particular for the female characters. It’s not to be interpreted as fan service but rather a work of art. On the other hand, there are some body parts in this anime that can be distracting. The one most worth mentioning is the overly extensive necks that can make viewers point fingers at. At the core of its technical feature is the music. It’s what makes the ballroom dancing come to life along with its vivid choreography. The anime mixes in a variety that includes jazz, latin, classic, and among others. Director Yoshimi Itazu really made an impression through his work by allowing the music to do the storytelling on many occasions. Without words, many of the dancing segments feels like a dream and as if time itself stopped to showcase the characters’ talents. The music supplements that with its directing. Voice character mannerism is also well performed with characters like Chinatsu, Hyoudou, and the Akagi siblings. Both the OP and ED theme songs are also worth listening to for their rhythm. As a show with a fierce competitive energy, this one might seem to be intimidating to watch at first. However, it’s a show that I can recommend to anyone even if its selling points doesn’t hit all the marks. From its character cast to storytelling, Ballroom e Youkoso is a well-adapted manga that focuses on what it intended to without betraying expectations. Sure, some characters are not as well focused compared to the others. There are also times when you wish the story can just move its pace faster. However, it’s still a show that gives competition a powerful meaning. Have I properly read the manga for Welcome to the Ballroom? No, but I have seen it; I’ve seen more than enough to know that the original creator put a ton of work and passion into his manga. While you could make the same argument for the anime, you can’t argue about the anime’s budget. Yup, that’s right ladies and gentlemen. Production I.G. themselves finally made what I think we can all agree to be a BAD ADAPTATION. It’s sad too because when you watch either OP as well as a quick (nine second) scene in episodes 11 and 24 you can really see what could have been. It’s a shame Production I.G. didn’t have the budget to make this show at it’s full potential. Other than the constant stain of the lack of a budget, the show is actually really good. The characters are likable and hatable when they need to be, and the story progresses at a, sometimes slow, but overall reasonable pace. This pacing really allows you to notice the changes in the characters’ respective dancing styles and moral outlook on the sport. Their relationships are charming and you can see where everyone’s coming from in any decision making process. Some flashback-backstory in the latter half of the show is a little forced, but that doesn’t mean the actual content of said flashbacks were bad at all. The voice actors and actresses are definitely not getting paid enough; some of these characters, especially the cute girls, had me down for their characters on their voices alone. That on top of the already competent script was great to listen to. It’s there, but the animation is still a real hindrance. There’s scenes throughout the show that really make you get along with the emotions and the themes the show is presenting, and you almost feel inspired. Again, I imagine the source material was really something special. It’s a shame the anime wasn’t able to give it justice. Overall, I’d say give it a watch, but don’t hesitate to drop it. I don’t really believe in the “three episode rule” because while some shows put everything they have to offer in episode one, others sometimes don’t reveal all their cards until the double digits. For Ballroom, I’d say that if you don’t like it by episode six, don’t worry about it. Anime Has often surprised me with the fact that how unpredictable it can really get. We often think to ourselves, that having watched so many shows, nothing can really surprise us anymore, But yet again, we are proved wrong with every new season. Take Fune wo amu for example, I never thought i will watch an anime about dictionaries, And yet I found myself loving it more and more. And now we have Ballroom, An anime which explores the world of ballroom dancing, A sport which is perhaps is one of the most peculiar one out there , and perhaps the most elegant one too, And surprisingly makes it more interesting than you might really expect it to be. Sports anime have existed pretty much since the beginning of the medium itself. From football to basketball, and even Shogi, We have seen almost all kind of games, And its not wrong to say that these anime, rather than the game, are now all about building the hype and adrenaline rush within the viewer, and keep them captivated. Welcome to ballroom explores the world of ballroom dancing, which as a sport is not really that well known to many, But Rather than just being all about the game itself, Ballroom is somehow able to bring out the true beauty of Dancing, Not as a sport, But more as a form of art. It also gives the competitive vibe of the game as we would expect from any other sport anime. Now,When it comes to the story, Sports anime are not really known for their story lines. Of course we have seen sport anime, with some pretty amazing storylines, But as mentioned before, Many of them are really all about sports, Which is not really a bad thing. Ballroom also offers little in this department, What we see is the generic run off the mill plot line that we we have really seen a hell lot of a times before. But, what really differentiates a good sport anime from other genre of anime, is that how it overcomes the lack of a proper story line , by offering the viewer something more than that, That is , The real excitement of the game itself. The anime can be simply broken down into two parts here, The first one is more focused towards Tatara, The MC, as a a learner, who is slowly trying to grasp the concept of dancing . He is just a newbie who is learning , and is not someone you will refer to as a good dancer. The second half on the other hand is about how overcomes his weaknesses and learns more about himself . How he also tries to prove himself as a worthy dancer and built his identity in this world of dancing. Characters, universally are known as the most important part of any anime , However, In such anime, their role is of much more importance than others. Ballroom shows The conflicts, self doubt,excitement, and of course, the anxiety, that the Characters hide behind their smiling faces on the stage. Now, talking about characters, we should also see that the other characters are not overshadowed in any way, In fact they actually shine out the most in the first half of the show, quite literally. Both the girls, Mako and shizuka, have played important roles in the development of Tatara as dancer. They have both played as his partners and have been major part of the story. Sengoku san served as his mentor and have taught him everything he knows. These other characters do have played major roles, but just in support of Tatara, That is for the most part, and we do not really get to see a lot about them, But as said there presence is not overshadowed. In fact, one of my most favorite parts of the show was the Mako Tatara solo, in which Mako was the main presence and she quite literally shone beautifully like a flower. Like other Sports anime, Ballroom also brings along with it , some in depth trivia and facts about the sport. It just shows us how watching people dance and actually being on the stage is completely different experiences. .It also goes a bit deeper by showing us the psychological battles that these people go through while on the stage, The anime shows how much does an actual person goes through when on a stage, The split second decisions and of course To maintain The focus on the partner. But more than that, It shows the true happiness These people feel while on the stage. Honestly, The show does and excellent job of portraying all these complex feelings of these people, without being too forceful with it. Now when we talk about dance, music is something which naturally comes to our minds along with it, So as one would think in such anime music of course would play in important role. Now Both the Op are very good in my opinion, They tend to be fast paced and built the excitement within the viewer. The music played within the scenes, That is during the dance routines, is somewhat overshadowed, Now the anime is focused on dance, but music is as important, The anime uses different styles of music and effects for different dance routines, however the music sometimes, just tends to get a bit overshadowed, which is not really good. Both the ED are also pretty fine, Tho second one is my favorite. The art, I guess, is just pretty average. The anime uses a bright color palette , Which fits quite well with the series, But there is really nothing special heer, That is , until the things get on the stage. The beautiful animations during the dance literally make the characters and music , come to life. The smooth movement, the Beautiful special effects just makes things even more beautiful. The character design is also pretty fine, but thins get real when they are on stage, The facial expressions they make are more than enough to convey their satisfaction and happiness. Overall, The art section is really well done . Now dance is something which we would expect to see in a sports anime, But don't let that fact deceive you, Because this show is nothing less than any other sport show out there. Its fast paced, beautifully animated and gets you excited and makes you wish for even more. It is something everyone should experience once. It shows something like dance, which we might not really think of often, in a way we would never expect. It does have its flaws, however, in total, Its an enjoyable ride, that everyone should try.